This was briefly mentioned in the Black Fuggin Friday post, but I thought it was worthy of some extra attention. If you treated yourself to a new mod this week, chances are you’ll probably need some batteries to go with it. 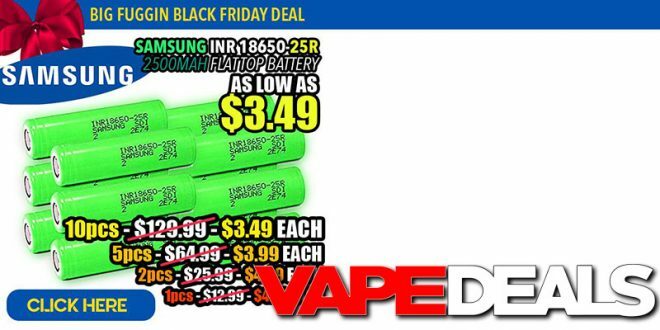 Well, the Samsung 25R is still one of the best all-around 18650’s on the market…and Fuggin is selling them cheap! You can buy 1 for $4.99, 2 for $8.98, 5 for $19.95, or 10 for $34.90. So, if you purchase a pack of 10, you’re lookin’ at just $3.49 each! I’m not sure when this sale ends, so stop by and stock up before it’s too late. **You can check out Mooch’s Bench Test Results HERE.